A niddy-noddy is used to make skeins (or hanks) of yarn, which are basically just big coils of yarn. When yarn is in skein form, it is possible to wash it or dye it, and then hang it to dry. This isn’t possible with yarn in ball form, as a wet ball of yarn will never dry out. So as part of the yarn recycling process, I skein the unraveled yarn in order to wash and dry it (to relax the kinks, and restore some loft to the yarn), and dye it if I’m planning to do that. 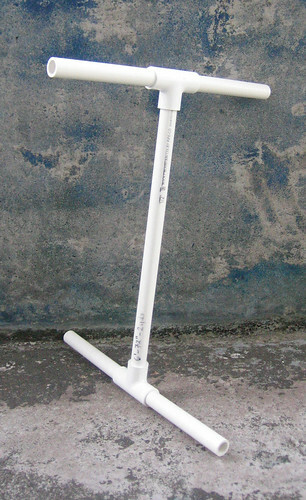 My niddy-noddy is made of pvc plumbing pipe which can be purchased cheaply from a hardware store. Instructions for how to make a niddy-noddy like this can be found at ‘As The Yarn Turns’, but it is relatively self-explanatory by looking at the finished product. 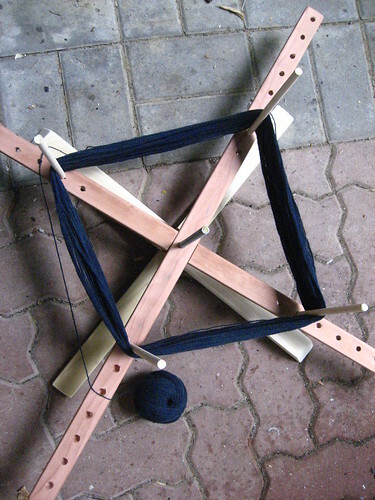 A yarn swift is the second tool required for dealing with yarn. It holds skeins of yarn in a secure format while you unwind them, and wind them into balls. Basically this avoids the situation where you annoy all of your friends and relatives by asking them to hold your skeins between 2 hands while you wind the yarn into balls! It’s not absolutely necessary, but it is convenient. To make this swift I followed the excellent tutorial found at Crafty Diversions. Basically, these tool are necessary because when dealing with yarn, you’re dealing with a VERY long, VERY tangly material, and you have to go to a lot of trouble to avoid it becoming a tangled, unusable mess of knots. You can get by without these tools, by winding skeins between hand and elbow, or around a chair back, I found that those popular reclining garden chairs make for the best assistant, and by holding them on your knees to unwind them, however, it cost me ~ $10 to make both of these items, and they make everything yarn related a lot more convenient!